Understand your application behaviour and eliminate errors by drilling down to the individual lines of code. Optimize your application performance and stay ahead of outages. Troubleshoot 3 applications for just $35/month. Slow is the New Down. Accelerate your Monitoring Efforts with APM Insight. Analyze your application behavior, from URL to SQL queries. Monitor critical JVM metrics like CPU usage, GC count and get alerted during outages. Visualize the application experience of users in real time. Analyze and segment performance by browser, platform, geography, ISP and more. From desktop applications to Windows Service performance, we've got everything covered. Also, monitor your .NET applications deployed in AWS and Azure environments, with a single agent. Monitor key performance metrics of applications accessing a variety of services on the two most popular cloud based environments AWS, and Microsoft Azure. Monitor the performance of your PHP applications, deployed in both Linux and Windows platforms. Get detailed performance metrics of mobile apps on both iOS and Android platforms. Enhance end user experience by resolving issues as and when they occur. Monitor and trace all performance issues of applications running on Ruby on rails from slow database queries, and web services to background jobs. View production, application logs, and performance issues in the same console. Your developers and IT Operators do not need access to production servers for server troubleshooting. Gain end to end visibility in to your Node.js application performance. Track all triggered events and asynchronous calls to enhance your application performance. Keep track of the response time taken by each application. Site24x7 APM Insight identifies slow applications and helps in isolating bottlenecks quickly. Identify slow queries using traces. Deep dive into the individual traces invoked by a single web request to see how the various methods have performed. Identify performance bottlenecks by drilling down the transactions to pinpoint the cause of trouble. Constantly monitor the total number of requests the application server has received per minute (RPM). This gives you complete visibility of how your app server is performing and how it can be rationalized. Track all your background transactions. Keep track of the response time taken by non-web/background transactions in your applications, ones that are spawned in background threads. Get traces of the background transactions with details on method level performance along with the time taken by database operations. Pinpoint errors and eliminate bottlenecks. Get to the root cause of all web and non-web transaction errors through a single view. Get a complete snapshot of the error with method level insight and take required actions before end-users are impacted. Capture exceptions as they occur. Get the list of all the exceptions that occur in the application server. Gain insight into all transactions that cause exceptions and view graphical representation of the count over a period of time with a clear indication between critical and non-critical ones. Comprehensive view on all your DB operations. Use Apdex scores to monitor end user experience. Application Performance Index (Apdex) gives you the statistics from a user experience perspective. It is an open standard to measure user satisfaction regarding a web application. The data collected over a period of time are converted into a simple index based on the application responsiveness. Understand the way your applications connect and communicate with external components. Identify component failure at a single glance and debug method level errors and optimize your application performance. Get visibility into the amount of time spent by each web request on different components and identify which component consumes most time. Also add your own component for more in-depth monitoring. Integrate APM Insight with Site24x7 RUM. APM Insight and Real User Monitoring (RUM) are now contextually integrated. With this integration, you get a holistic view of an application's performance from a single console. 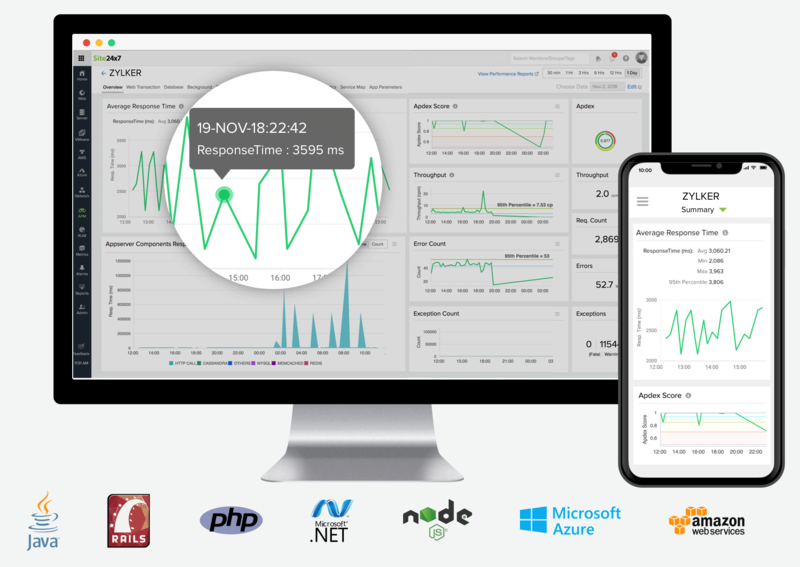 All critical metrics, such as the application performance from the users click on the browser, the time taken in back end to process the request, network latency and the time consumed in rendering the response including soft navigations is all captured and displayed in a single console. Additionally, both the browser time and server time is integrated enabling in analyzation of all the metrics together helping in fine tuning app performance. Support provided for a wide variety of application servers. Monitor the health of your Java applications running on different application servers. Site24x7 currently provides out-of-the-box support for Tomcat, WebSphere, WebLogic, Glassfish, JBoss AS, JBoss EAP, Resin, WildFly and JOnAS application servers.